A Greek gift to be aware of, not beware of! Greece, the cradle of the wine industry, has produced some of the world's best wines for millenia, but historically they kept and drank the best (and until recently exported the duff, especially to Germany, and in particular Retsina [not all of which is horrible by the way]). Nowadays of course the ready market among the chic and well heeled of Athens and Thessaloniki is somewhat diminished (although there are still a LOT of very wealthy Greeks - they just aren't showing it off like they used to), so some of the best estates are making concerted efforts to export. Which, unlike most places in Europe, means printing entirely different labels with a different alphabet, so is an effort. Well worth searching out. The UK market however is "like trying to move sand uphill. With a fork" as one commented. 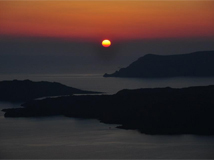 Greek Macedonia has a climate entirely like that of Bordeaux and Piedmont (regular cold winters - skiing even) and moderate sunny summers - perfect. Greek wine is ridiculed only by the painfully ignorant. I firmly believe that some of the best wines I have ever tasted were made by Vangelis Gerovassiliou, and I have tasted an awful lot of wines in my time! 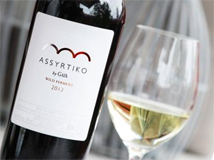 Last week we tried Assyrtiko Wild Ferment Gaia 2013 Santorini. 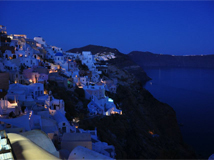 Assyrtiko is the native grape of the volcanic island of Santorini. 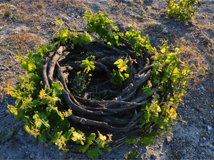 Here the wind blows and the vines are trained like a doughnut to form their own windbreak. The charcoal dark soils add a huge almost saline minerality to the citrus and lemongrass flavours of the grape. It's rare, but this is truly one of the world's great wine styles. 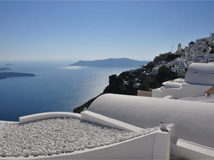 Gaia is one of Greece's most progressive young producers with winery operations on Santorini and also north in the mainland (Nemea). Here on the island the Assyrtiko grapes are given a period of contact with their skins to capture flavour, and then the juice is transferred to mixture of stainless steel tanks (for freshness) and wood (oak and acacia barrels adding a roundness and honeyed quality). At this point nature takes over and the man-made intervention of winemaker Yiannis Paraskevopoulos stops. The indigenous 'wild' yeasts start the fermentation adding depth, while warming up the wine creating richness to accompany the naturally high lemony freshness of the grape. From simple feta cheese salads to complex fish dishes, especially those involving lemon or fennel flavours, this wine needs only a bit of sunshine to be absolutely perfect.